The first place I always start when I'm getting ready to plan a trip is Rick Steves' guide books. Mr. C&G and I have been following his recommendations for the past 16 years and he's never steered us wrong. We got off the plane in Milan circa 1997, bought a phone card, found a pay phone in Malpensa airport, and called to reserve a room for that night in the Lake Como town of Varenna that Rick highly recommended. We had the most charming room with a terrace overlooking the lake that we never would have found on our own, especially in the days before the internet and email. Best of all the adorable Albergo Milano Varenna still shows up in his 2012 guidebook and is still run by the same family. These days our travels require much more advance planning. Thankfully Rick is still writing and still traveling, and keeping it all updated on his website. His books aren't as kid friendly as I'd like, but I absolutely trust his opinions on what to see and what to skip on your adventures. His mostly hand drawn maps will tell you where to go, how to get there, and what there is to eat nearby. Helpful walking tours and museum tours describe the highlights that you won't want to miss, allowing you to save energy (and the kiddos energy) by not trying to see it all. 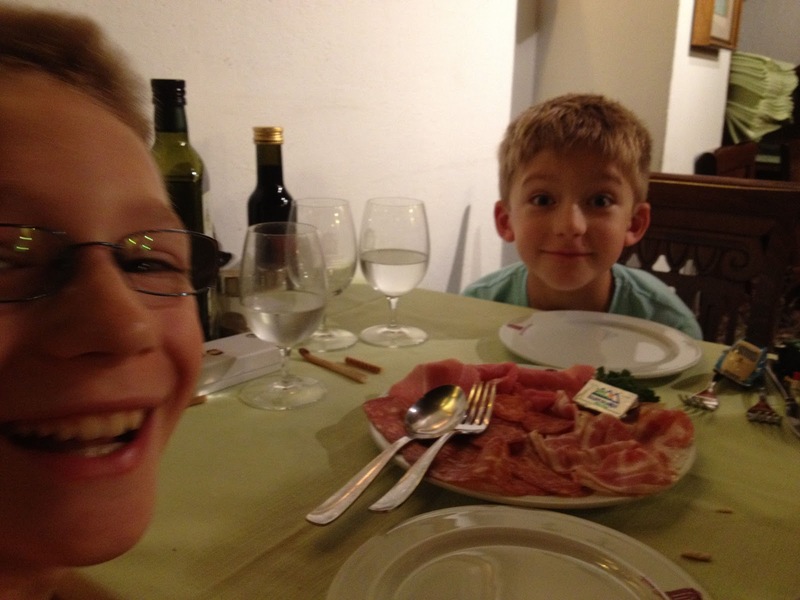 Ristorante Antica Sacrestia in Venice, thank you Rick! Rick is very big on hostels (as you can imagine, C&G is not) and budget friendly dining (again, not), but he's also great at recommending restaurants where the locals dine. We took his advice and found a tucked away little restaurant in Venice where we were the only Americans. Almost an impossible feat for this overcrowded floating island. DK travel guides are best known as the weighty, full of lush color photography guide books that you don't want to carry around on your travels. I make an exception for their well researched Family Guides, worth their weight in gold. The Family Guide to Italy was indispensable on our trip last year, and even in the months leading up to our departure. Other European Family Guide titles available include France, Paris, and London. These books are the perfect resource for planning your family trips. The colorful photos and maps will help you figure out where to go and what to see (cross referenced with Rick Steves). "Letting off steam" sections will tell you where the nearest open green space is to let your kiddos run around, always key after being cooped up in a museum or similar attraction. "The Lowdown" tells you all the necessary info (hours, admission, etc.) that you wish you'd written down before you left home, along with the ever important where to get food within quick walking distance before your kiddos melt down. "Kids Corner" sidebars offer interesting facts, a bit of history, and some trivia for your little adventurers to follow along at your destination. Stadt Hotel Citta, thanks Family Guide to Italy! Each chapter focuses on a particular region, and within each section you'll find truly family friendly hotel suggestions. European hotels are not known for their size and you don't want to be squeezing your travel weary family into cramped quarters. 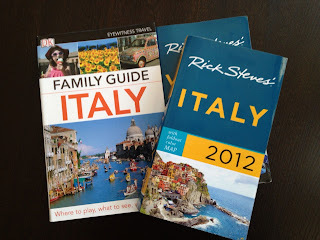 Every hotel we stayed at in Italy I found through the DK Family Guide to Italy, and all had great family accommodations. 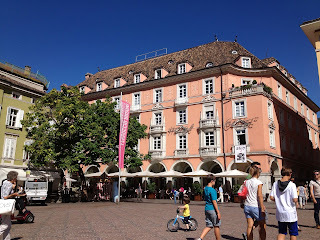 Our two bedroom family room in the Italian alpine town of Bolzano was a big hit with the little C&Gs. 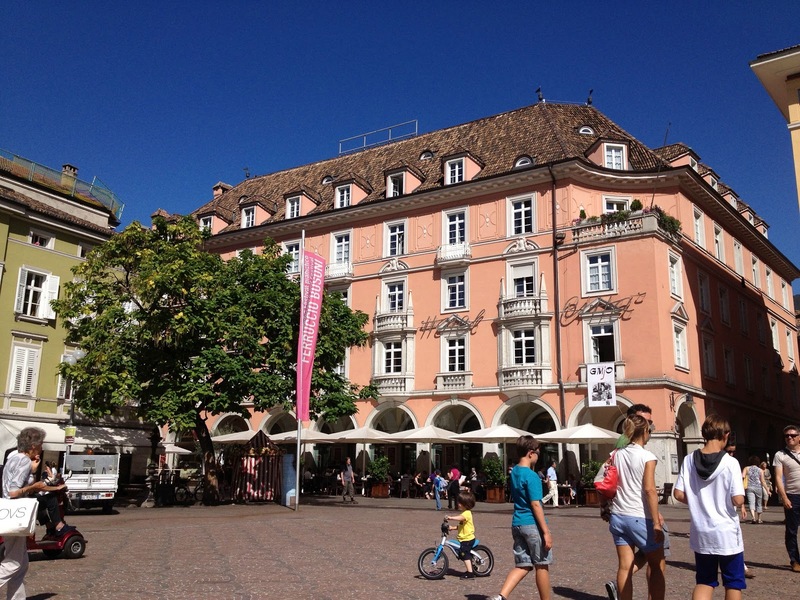 The Stadt Hotel Citta sat right on a charming square surrounded by restaurants, gelato stands, and plenty of space to run around. The family room had the perfect set up with three twin beds lined up in a row in the second bedroom. Think Goldilocks and the Three Bears, the Italian version. The little C&Gs bounced back and forth between the three until they found the one that was "just right". I love good old-fashioned guidebooks too, especially the DK ones. Always good suggestions. PS - The boys are so cute!